As I’ve mentioned before, the fireworks at Disneyland are something special. 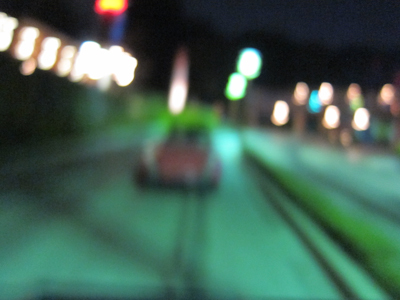 I’ve heard the best place to watch them is from the Storybook Canal Boats or the Matterhorn, but one night we caught them while we were riding Autopia. 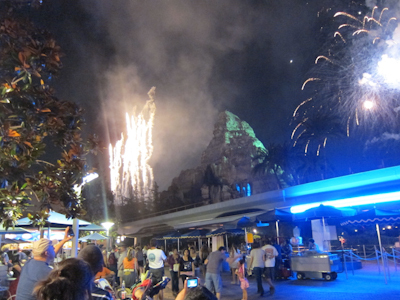 And mixing fireworks with a ride like Autopia is pretty much all kinds of awesome. The show started before we boarded. 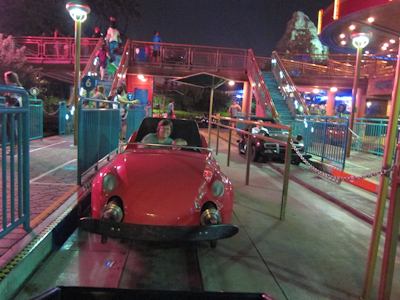 Autopia is one of Theo’s favorite rides, and why not? It’s one of my favorite rides too! I always thought that driving the cars was awesome but that once I could grow up and drive a real car, that would be even better. NOT TRUE!!! 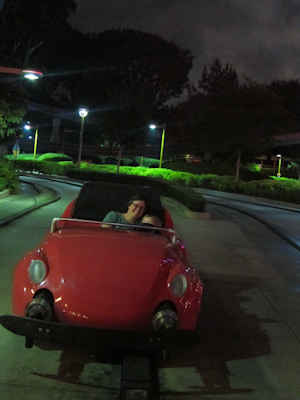 There’s just something about driving the miniature Autopia car that is just pure fun. You don't get to really pick your car color. Thank goodness Theo was down for red. 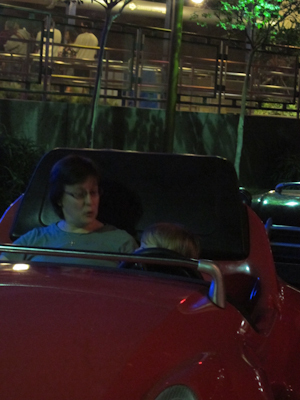 Theo has just now hit the height of what’s allowed on Autopia. 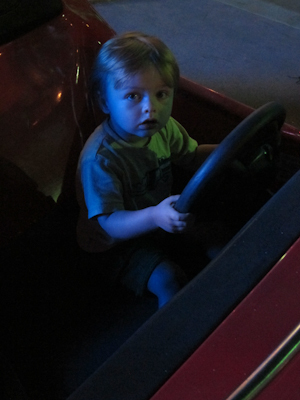 He can officially drive. He cannot, however, actually see over the steering wheel. Since Theo is on a Mr. Independence streak, he refused to let me steer or even curl my arms around his back and then sneak up and steer. So basically I just let him ram into the rails on the whole path. Whatever. KEVIN IS AN AWESOME PHOTOGRAPHER!!! actually, Kevin IS an awesome photographer, but this is not his best work. Anyway, snuggling with Theo is always fun. But the fireworks were the most fun of all. 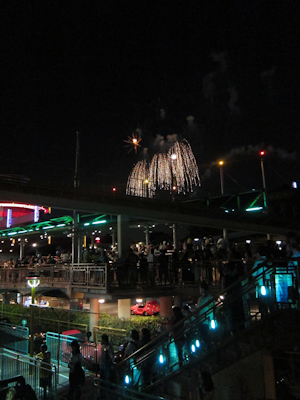 It’s always interesting getting a view of the fireworks from various places in the park. 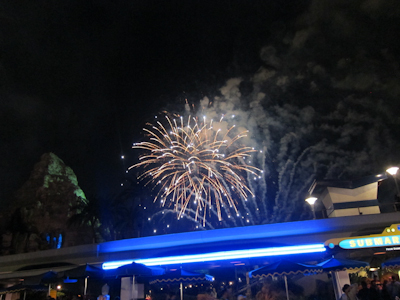 But overall, I just love Disneyland fireworks everywhere I see them :). 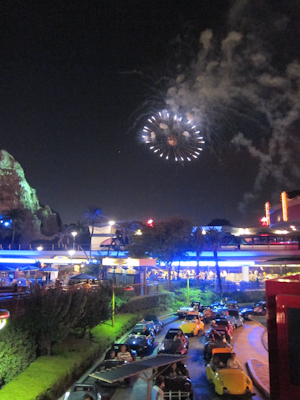 Right over the Monorail track! I know you’re always bagging on your abilities as a photographer, but the one of the happy face over Autopia and the one over the monorail track are, like, postcard-quality good!! Oh thank you! Yeah, I do pull out a good one every once in a while ;). The bad ones are usually when I’m trying to take a picture while I’m moving (you’d think I’d learn) or in the wrong lighting conditions. Maybe by the end of this blog I’ll be a better photographer!